I am a certified artichoke fan. It’s not only delicious, it’s also very nutritious! 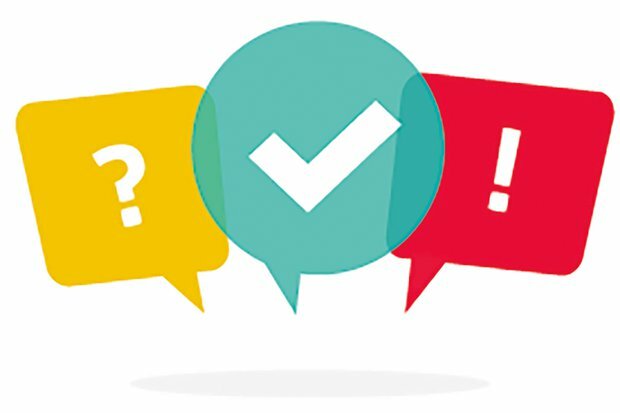 If you have been following our blog posts for some time, you may have already come across our Leaky Gut Diet and Gallbladder Diet. Both contain globe artichokes as a must-eat for our gallbladder patients. Similar to Jerusalem artichokes, it is beneficial to patients with gallbladder, liver, and gastrointestinal problems. Here are some of the health benefits of globe artichoke. A healthy gut is crucial for brain health and immunity. If your gut is messed up, you may experience a domino effect of various symptoms and your overall health may be compromised. This is why globe artichokes are very beneficial for anyone who has GI, gallbladder, autoimmune, or liver issues. 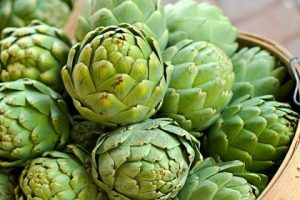 Aside from maintaining a gut flora with predominantly helpful bacteria, active compounds in globe artichoke accelerate gut movement, support fat digestion, stop muscle spasms in the stomach, and nourish the gut lining. All of these globe artichoke benefits help patients with IBS and other digestive conditions. Commons symptoms like bloating, nausea, indigestion, and heartburn can also be relieved by taking globe artichokes, especially concentrated artichoke extracts. Treatment or supplementation with artichoke extract may help protect the liver, increase bile protection, and support detoxification. Artichokes contain silymarin, a very strong liver protectant. Other components found in the plant also helps increase the rate of liver tissue regeneration and stimulate cell division which may stop and reverse liver damage. 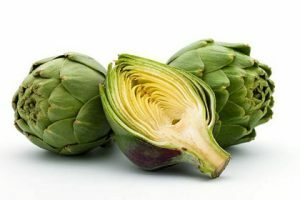 Artichoke also contains a lot of bitter compounds like cynarin, and sesquiterpene-lactones; and in a separate blog, we have discussed the numerous digestive and biliary benefits of taking bitters. A word of caution though, if you are suffering from symptomatic gallstones or if you have bile duct obstruction, you must take globe artichokes or artichoke extract with caution. You may consult your doctor before doing so as an increased bile flow may worsen your gallbladder symptoms. Obesity is probably the most common chronic disease in developing countries. It is not just something gallbladder and GI patients need to be alarmed about. Rather, maintaining a healthy weight should be everybody’s concern. If you want to achieve the ideal weight and you’re modifying your lifestyle to achieve this goal, make sure you include globe artichokes in your meal plan. Artichokes are a filling food source. They are high in fiber and protein, yet low in calories and fat. They increase satiety, prevent cholesterol build-up, and reduce inflammation. All these benefits not only help you achieve your goal, but help prevent heart disease, diabetes, and other metabolic disorders at the same time. Globe artichoke (Cynara cardunculus) is a plant originally cultivated in North Africa. But because of its taste, nutrition, and aesthetic value, it’s easily found almost anywhere in the globe. In the US, the majority of globe artichokes sold in the market are grown in California and are available year-round. The artichoke grows as high as 1.5 to 2 meters tall with silvery-green leaves that are 50 to 82 cm long. Its flower bud, that can be about 8 to 15 cm in diameter, is made up of a fleshly base with tightly packed triangular scales. The lower portion of the scales and artichoke ‘heart’ are the most commonly eaten parts. The chokes or the immature florets in the center of the bud are also edible in younger flowers. How do I choose a good globe artichoke? When choosing globe artichokes for consumption, choose one with a bright green color which looks hydrated, firm, and heavy. It is best to get an artichoke with the petals still closed because it helps guarantee freshness. Ideally, it should be cooked and eaten a week after purchase. To keep it fresh, make sure that you store it in an airtight plastic bag. There are 140 different globe artichoke varieties. Among all these, only 40 are commercially grown and sold for human consumption. The varieties are identified based on their color, size, and spine. And since these different kids hail from various countries, their names also sound very different. *Figures are based on 1 medium artichoke (120g), boiled, drained, and without salt. Artichokes are not as popular as prunes or oats as a fiber source. However, they are actually a better choice if you want to pack in as much fiber with fewer calories. One serving of artichoke contains a quarter of the daily amount of fiber recommended for adults. It is rare for vegetables to have as much protein as the globe artichoke has. 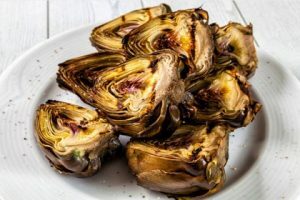 And if you are like many of our gallbladder patients who are looking for alternative protein sources to avoid eggs, meat, and nuts, globe artichoke protein may just be the solution for you, packed with extra benefits for your gallbladder. Cynarin is one of the remarkable constituents found in globe artichokes. It is present in highest concentrations in the pulp of the leaves but is also found in artichoke leaves and stems. This active compound is especially beneficial for gallbladder patients because it is responsible for the enhancement of bile production. It also helps the kidneys increase urine production. That’s why it is able to give a natural boost to support detoxification. Artichokes contain a form of fiber called inulin. It is the sweet-tasting starchy substance that is also the most available and preferred form of prebiotics used in research studies. This is the main ingredient common to both Jerusalem artichokes and globe artichokes. Many of inulin’s actions are caused by bacterial metabolites. Inulin serves as a prebiotic which means that increases the presence of good bacteria in the gut. The metabolites use the inulin for energy. Once they have enough energy, these metabolites acidify the environment inside the colon. This stops the growth of potentially harmful species and enables bifidobacteria and lactobacillus to thrive. There are a number of ways to enjoy globe artichokes. They can be boiled, steamed, deep-fried, stuffed, grilled, or eaten raw. Some sauté them or use them in stews or soups. There are commercially available artichoke teas that you can readily place in hot water and drink. You also have the option of doing it yourself by steeping the flower portion in water and drinking it as an herbal tea. It has a bitter, woody taste. Globe artichoke supplements are available in different forms. You may use an artichoke extract, artichoke capsule, or artichoke tablets. Though the leaves are not consumed as food, studies say that the polyphenolic compounds with therapeutic effects are mainly found in the leaves. Apart from being a part of your daily diet, globe artichokes can also be used for flower arrangements and decoration. They can either be dried or used in a floral arrangement. If left alone, a pink or purple flower bud could appear out of the artichoke globe. If you can’t make globe artichokes a part of your daily diet, you may consider taking a supplement with globe artichoke extract. This way, you can still have your dose of inulin and cynarin every day without having to worry about cooking. There are many brands available in the market but if you’re not sure what to take, try this Organic Artichoke Leaf Extract. Bundy, R., Walker, A. F., Middleton, R. W., Marakis, G., & Booth, J. C. (2004). Artichoke leaf extract reduces symptoms of irritable bowel syndrome and improves quality of life in otherwise healthy volunteers suffering from concomitant dyspepsia: a subset analysis. Journal of Alternative & Complementary Medicine, 10(4), 667-669. Heidarian, E., & Rafieian-Kopaei, M. (2013). Protective effect of artichoke (Cynara scolymus) leaf extract against lead toxicity in rat. Pharmaceutical biology, 51(9), 1104-1109. Kirchhoff, R., Beckers, C. H., Kirchhoff, G. M., Trinczek-Gärtner, H., Petrowicz, O., & Reimann, H. J. (1994). Increase in choleresis by means of artichoke extract. Phytomedicine, 1(2), 107-115. Rondanelli, M., Monteferrario, F., Perna, S., Faliva, M. A., & Opizzi, A. (2015). 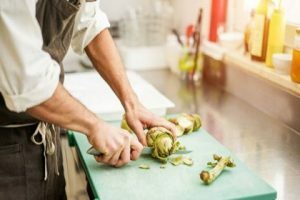 Health-promoting properties of artichoke in preventing cardiovascular disease by its lipidic and glycemic-reducing action. Monaldi Archives for Chest Disease, 80(1).